Children love to trade and collect these saint trading cards. Each high-quality card promotes a saint as a role model. 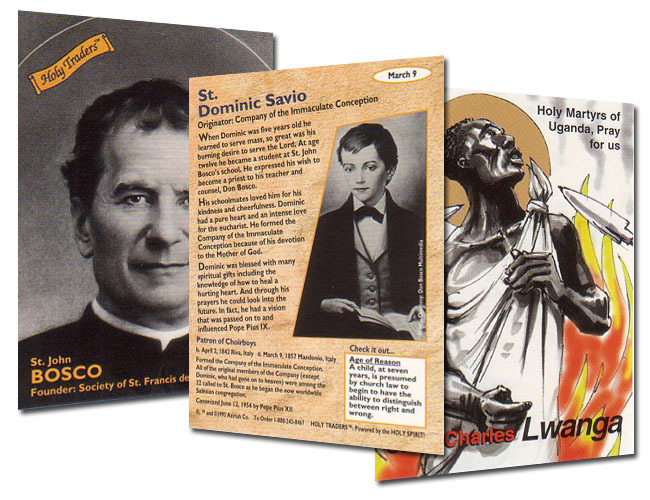 The glossy, full color cards contain a short bio, statistics and a brief catechism. Includes 7 rare pre-canonization cards. There are a total of 6 full sets of Holy Traders Cards available. Sets 5 and 6 can be purchased either individually, as part of the complete sets of 1-6, or as part of the Holy Traders Activity Kit. Just buy the Sets 1-4 to complete the whole collection!